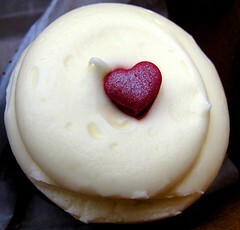 Free Food Alert: Red Velvet Cupcakes in Reston today! Restonites, arise! The new Red Velvet Cupcakery at Reston Town Center is giving out free cupcakes today as part of their grand opening. They start in just about an hour, so DC folks, you can still pile in your cars and head out the toll road in order to capitalize on the deliciousness! Expect a pretty solid line, though, but it’s worth it for a tasty tasty cupcake.